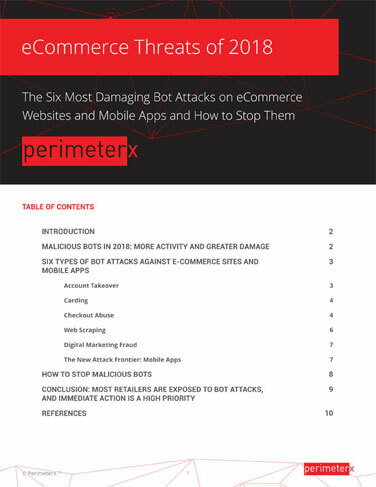 2018 is full of promise – of six major bot attacks that cause the greatest damage to ecommerce revenue and retail brands. Learn more about account takeover, gift card and credit card fraud, scalping, inventory hoarding, price and content scraping, digital marketing fraud, and – the new attack frontier – mobile app attacks. These attacks are on target to cause more havoc and financial damage in 2018, surpassing the record-breaking year for such losses in 2017. Behind the attacks are sinister bots directed by malicious criminals. They cost retailers, ecommerce sites, and their customers billions each year. How can you stop bot posing effectively as genuine customers, when outmoded defenses cannot detect them? Learn how to block even new forms of bot attacks on your website and mobile app.